Dhaka, May 18 (Just News): BNP chief's personal secretary ABM Abdus Sattar said Begum Khaleda Zia’s family tried to meet her on the first day of Ramadan with ifatr items, but they did not get permission from the jail authorities. 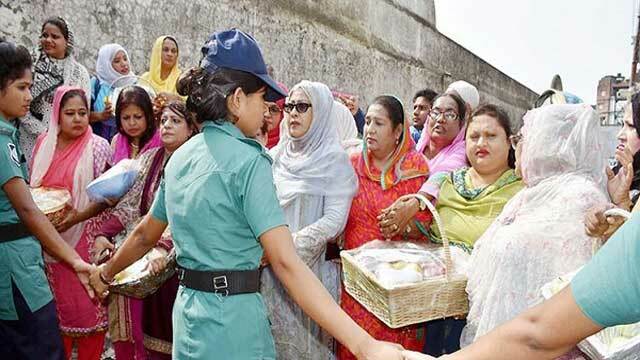 Bangladesh Nationalist Party (BNP) chairperson Khaleda Zia on Friday took iftar with her domestic help Fatema Begum in the Old Dhaka central jail with traditional items on the first day of the fasting month of Ramadan. A jail official wishing anonymity said cooked gram, peaju, puffed rice, date, juice and some fruits were there in the BNP chief's iftar menu. Khaleda Zia has been there in the jail since 8 February last as she was sentenced to five years' imprisonment in Zia Orphanage Trust graft case by a lower court. Fatema has been staying there with court permission. KhaledaZia used to take iftar with orphan students and alem-ulema (Islamic scholars) on the first day of Ramadan every year. BNP hosted an after party at the city's Ladies Club this year as well for orphans and alem-ulema. The chair of the chief guest of the programme was kept vacant as Khaleda was not there. Speaking at the programme, party secretary general Mirza Fakhrul Islam Alamgir said they arranged the programme with a heavy heart this year as their chairperson is now in jail. "She used to take iftar with orphans every year on the first day of Ramadan. But this time she took iftar solitarily in jail. It's very tragic for all of us. We pray to Allah so that we get her back among us soon," he added. Prior to the iftar, a munajat was offered seeking divine blessings for Khaleda's early recovery and her release from jail.